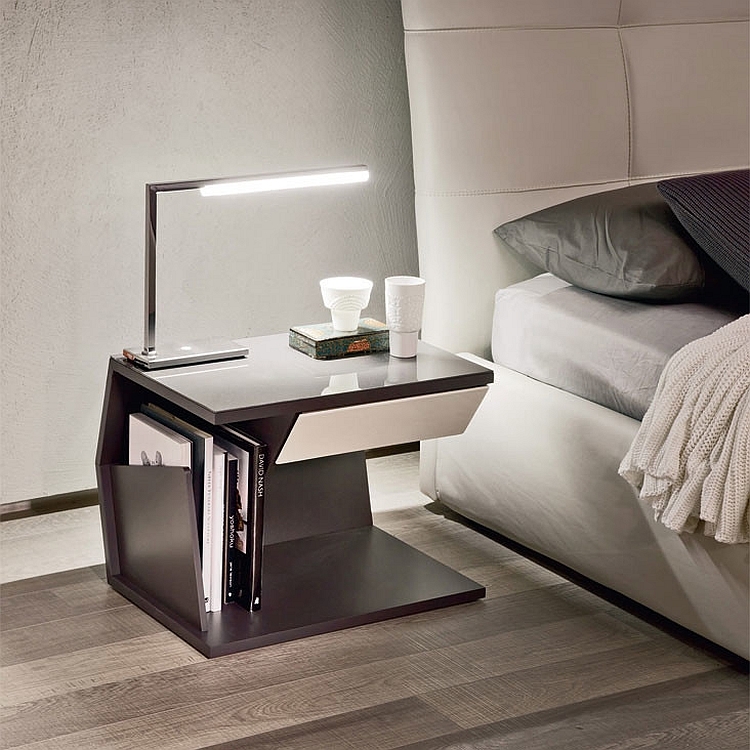 Modern bedside tables have taken several different shapes and forms in the last few years with designers churning out ingenious models that serve your every need. 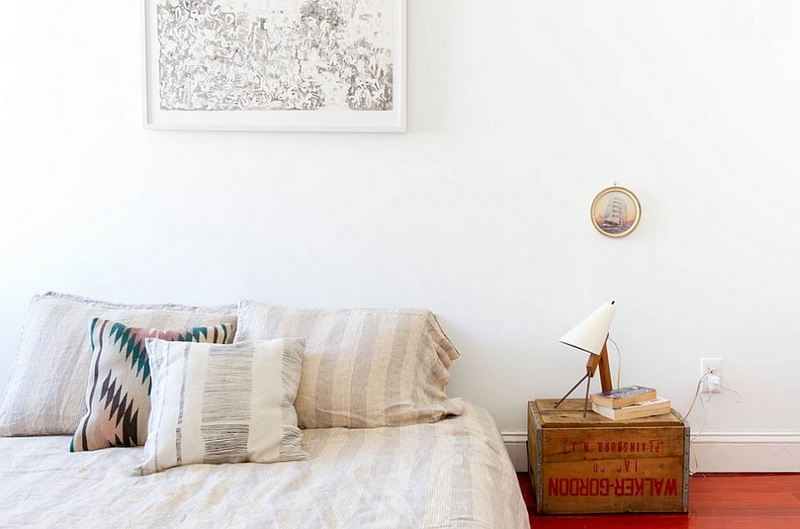 While some maximize precious foot space in a small bedroom, others let you tuck away all your favorite books with ease. A beautiful nightstand is often the perfect way to complete a stylish, cozy bedroom along with a lovely table lamp. 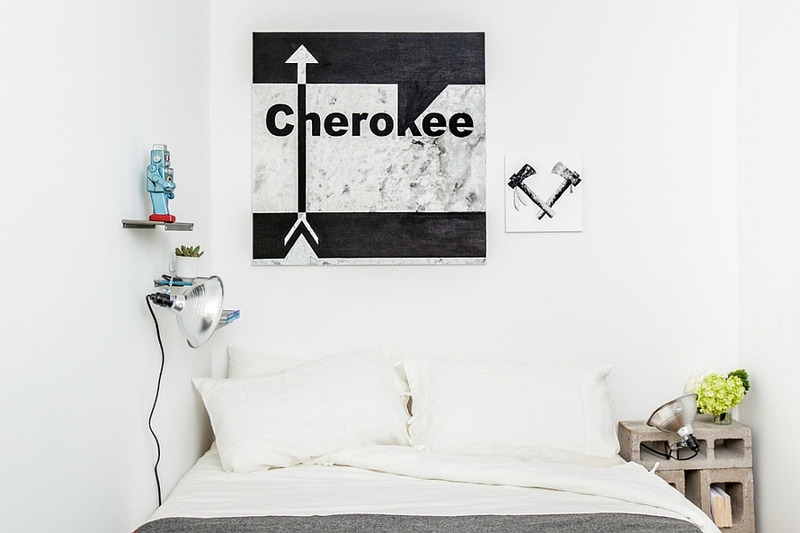 Today we have a selection of 10 inspiring nightstands, among which many can easily be crafted out of those discarded materials in your attic or the nearest thrift store finds. All you need are the right materials and some basic DIY skills! 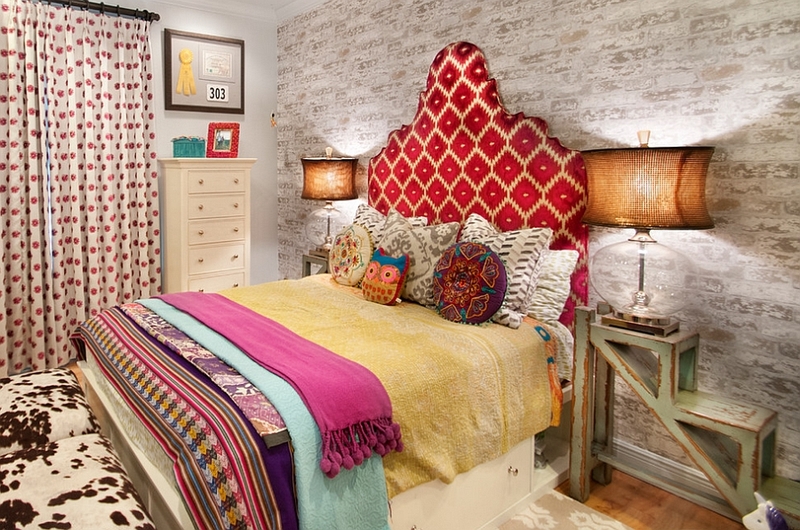 This fabulous bedroom does away with any sense of mundane boredom, thanks to its eclectic design, wonderful use of color and wallpaper that brings plenty of pattern and texture. Twin tables from Uttermost have been used as beautiful nightstands that accentuate the distinct style of the bedroom. 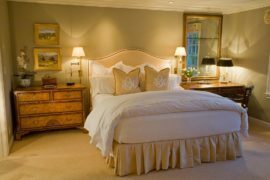 Stunning table lamps with copper-tinted shades add to the overall ambiance even as the headboard steals the show. 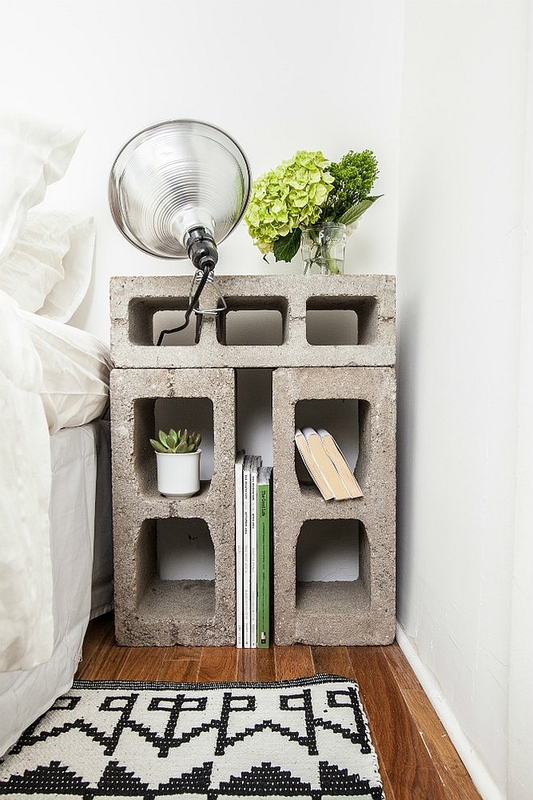 Simple, unconventional and catchy, this cinderblock nightstand design can be easily replicated in your own bedroom in a matter of minutes! Yet, it is the all-white, minimal backdrop of the bedroom, the subtle industrial touches and the clamp light that truly let this bedside table shine through. Giving you a cheap, easy-to-make and versatile nightstand, it is hard to think of an easier DIY bedside table idea! You might have seen plenty of trunks used as coffee tables in the living room, but this chic and trendy little trunk doubling as a nightstand surpasses them all in terms of sheer charm! 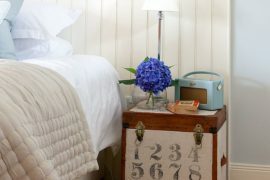 The bedroom has a transitional style with cool blue and white colors, ensuring that the small trunk stands out visually. Making up for its lack of height is the tall table lamp, while the vintage radio ensures that the sense of nostalgia is not lost in the modern setting. Repurposed crates are one of the hottest trends currently in the world of DIY projects and interior design. 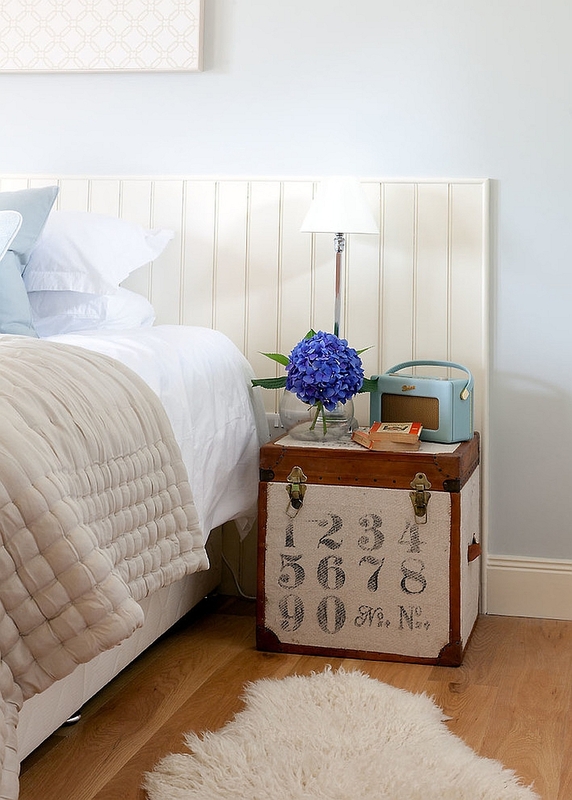 But this crate that doubles as a simple, elegant nightstand does not really need much work at all. 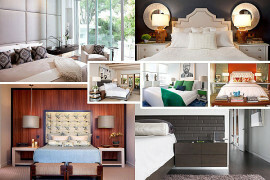 In fact, the low frame of the bed and the all-white backdrop makes it a perfect addition for such an unassuming setting. The style is both minimal and eclectic with interesting artwork capping off the visual. 5. Say Yes To Upcycled Decor! 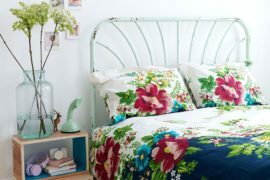 Really looking to add a unique upcycled addition to the bedroom? This old metal ballot box surely qualifies as one! Obviously not all of us can get our hands on an old ballot box, so just try to bring home an old metallic trunk instead to get the job done. After that, you can stick any message you want on top, and there is obviously plenty of storage space inside! Unable to find a vintage metal box that you like? 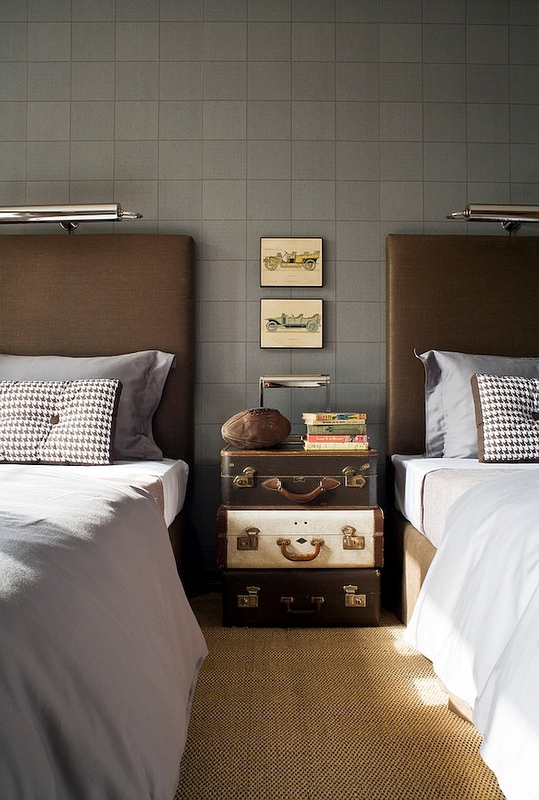 Don’t worry too much, as you can simply turn some vintage suitcases into a beautiful nightstand with ease. Again, not much work to do in your workshop here, as all you will need are two to three lovely vintage suitcases and some space next to your bed to stack them up. Remember, though, to pick ones that complement the color scheme of the room. Not one of those who really has the time or the skill required for DIY projects? Do not fret, as there are plenty of unique options even for you. This lovely nightstand draws its inspiration from trendy nesting tables, and its modern appeal is perfect for most contemporary homes. Accentuating the color scheme of the room, it does take up considerable space. The two nightstands in this bedroom draw your attention almost instantly, thanks to their creative design and the wiry base. Despite being tall, they take up very little visual space and bring elegant symmetry to the room, along with the tables lamps. 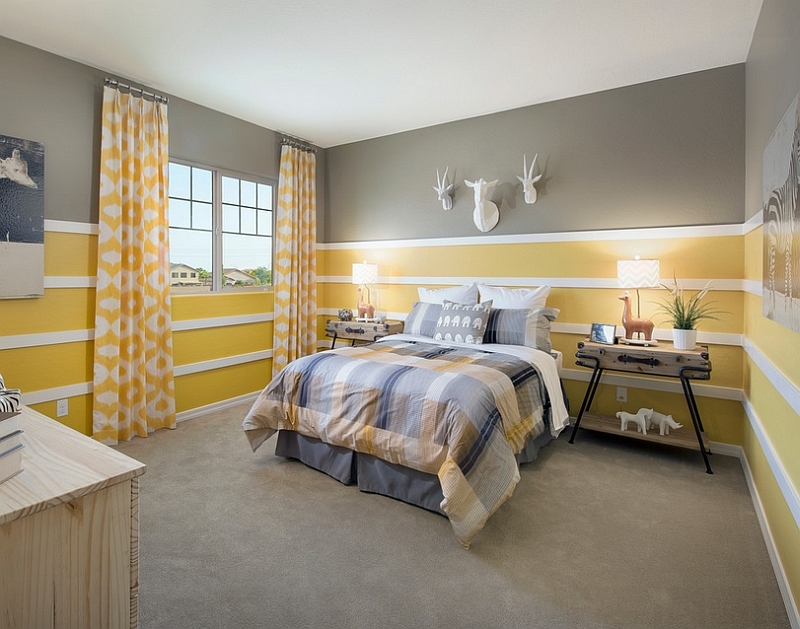 The subtle addition of chevron patterns, the posh yellow and grey color scheme, and interesting wall additions combine to give this room an inviting, sophisticated atmosphere. Do not have enough foot space to spare for the bedside table? This dreamy white and pink girls’ bedroom shows you how suspended bedside tables work brilliantly in a small bedroom. Not only are they great space-savers, but they also add to the glamorous appeal of the bedroom and the visually delicate picture it paints. We are a bit worried about the glass vases on these floating delights, though! 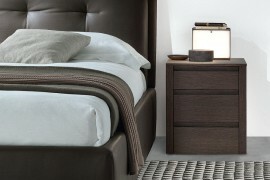 Finally, we have an ultra-minimal and classy nightstand that is for those who love sleek, contemporary design. 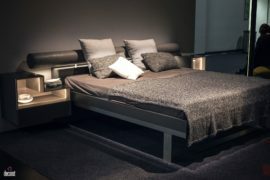 The bedside lamp chosen for the table complements the silhouette and the style of the nightstand, while the grey and white color palette adds refined elegance to the room. Hard to go wrong with this glossy beauty!